Unfortunately the glorious Indian Summer in Minnesota appears to be ending. That’s the way of it up here, I guess. The tempermental mid-Summer months were suffocating at times, keeping us indoors more days than I like. And the cool comfort of Fall just isn’t long enough. At least it was magical. Now the last couple of days have been gray, wet, and cold. I’m not ready for the long dark of Winter, though I expect my wishes won’t hold it back much longer. I suppose I should be thankful for the recent– if brief– temperate weather, because I recall as a child trick-or-treating in October during snowstorms. Memories of huge freshly-piled snowbanks, and the frustration of not being able to see because my glasses had fogged-up beneath my mask. Yes, it’s time to appreciate these few weeks, even if they are getting cool, windy, and wet. 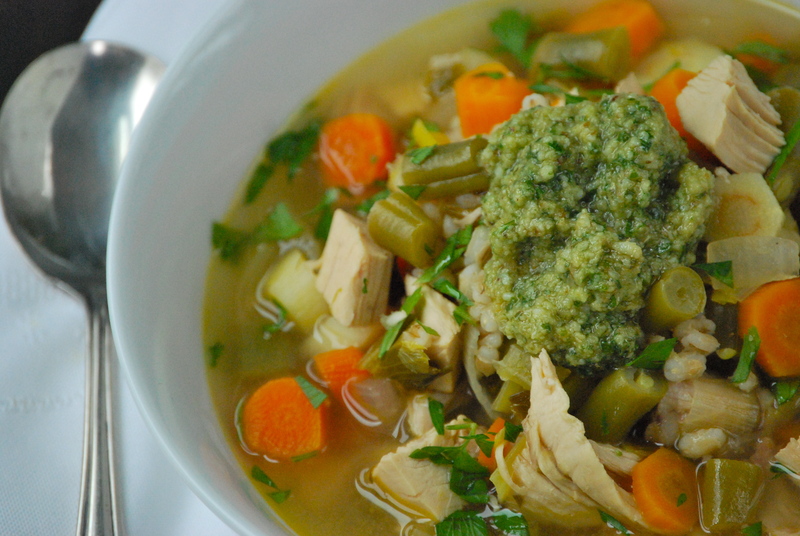 One benefit of the colder weather is that many of our meals shift towards warming comfort foods, like soup. I love soup. Not like a typical person loves soup, but on a fundamental– maybe inherited genetic– level. My Mom likes to declare that she “could live on nothing more than soup!” And she cooks up some divine ones. While I won’t be so bold as to say I could survive on it alone, soup gets me through those bone-chilling days. It’s genius– a hearty bowl is the best way to warm up from the inside out, and the smell of a simmering kettle on the stove for a few hours chases the cold away for awhile. 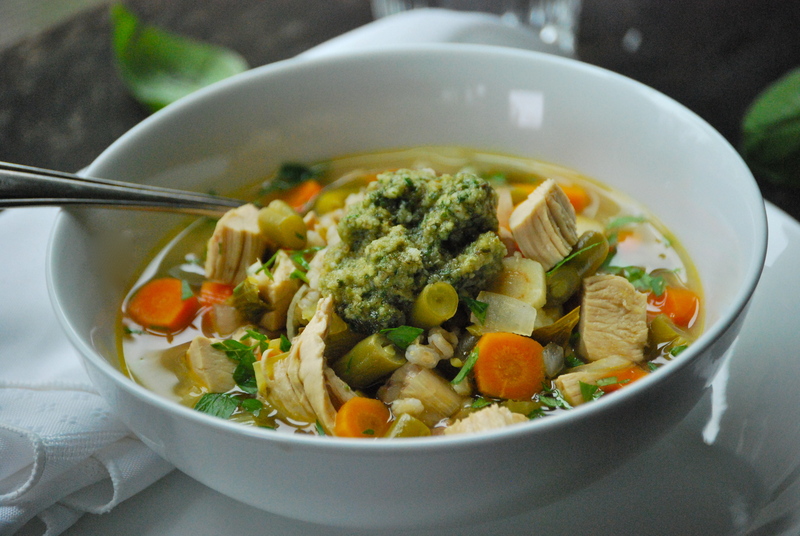 Today’s recipe is my variation on the old ‘vegetable-chicken’ soup that is the staple of so many Winter meals. While it may look familiar, it offers so much more than the simple vegetable, chicken, and broth flavors you’re used to. The reason is the addition of lemon and pesto (or pistou if you prefer to make it without the nuts…and want to show off your command of Provençal). The lemon provides a subtle, though noticeable, hint of interesting acidity. And the dollop of pesto is brilliant. It combines the boldness of fresh herbs along with a delicate saltiness. You can make your own, or buy it at your local market. For the meat, I generally use roasted chicken, though it is also beautiful with the more potent flavors of wild pheasant. 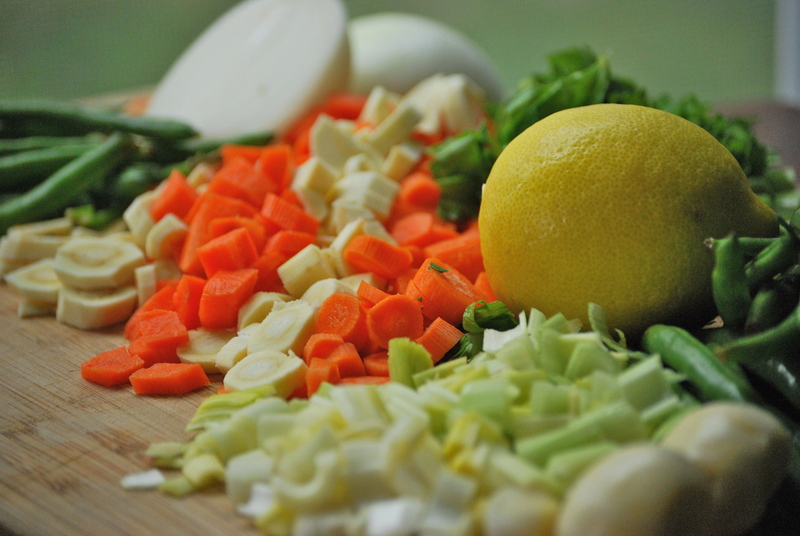 Like most soups, you can experiment with the ingredients to make it your own. 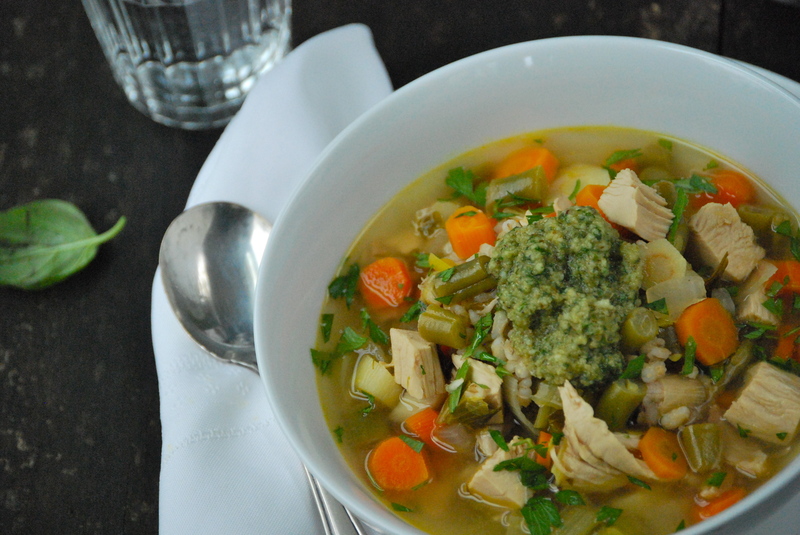 This soup has become a family favorite that we all love– even my little ones. I hope you enjoy it, too. To make the soup: Heat the olive oil in a large Dutch oven. On medium heat, sauté the onion, leek, celery, carrots, parsnips, green beans, and a bit of salt and pepper until the vegetables start to become tender, about 5 minutes. Add the garlic and sauté for another minute. Add the chicken broth, barley, chicken, and bay leaf. Bring to a boil, then reduce heat and let simmer until the barley is done, about 3o-40 minutes. Add the lemon zest and juice. Stir in the parsley. Season with more salt and pepper, if needed, and a pinch of red-pepper flakes. To make the pesto: Add the basil, parsley, garlic, Parmesan-Reggiano cheese, walnuts, pinch of salt and red pepper flakes to a mini-food processor. Pulse a few times to incorporate everything together. With the machine running, slowly add the olive oil. Adjust seasonings, if necessary. Serve a dollop on top of a bowl of hot soup. Enjoy! Thanks for stopping by Relishing It today — wishing you all a wonderful weekend!